Nothing beats the simplicity and elegance of wooden art when it comes to home decor and interior design. Be it wooden flooring or use of wooden door panels and cupboards, the suave charm of good, old woodwork never fades. And while maintaining the wooden embellishments to your home might not be an easy feat, one can’t just stop getting lured of all the variety that wooden artwork offers. That too at affordable, inexpensive rates. With an annual polishing routine and good care, a wooden piece of art might last as long as 10-12 years. This is especially true for wooden interiors. There is a wide variety that you could explore and choose from online when it comes to the use of wooden art for home and workplace décor. Here, in this blog, we will explore some creative and unusual types of wood sculptures. The internet is flush with e-stores and sites that feature wood art for sale at awesome offer prices. These stores usually exhibit exclusive collections of wood artwork for sale from the budding as well as established artists. You can always browse through online wood sculpture gallery of e-stores like ShowFlipper and discover a dizzying range of wood sculpture for sale. And when we say dizzying, we mean it. The exquisite range of wood art collection will blow your mind. And, you might be very well reeking of exasperation. Making a choice can be a tough call when it comes to selecting the perfect piece of artwork for your home, after all. But that is why we are here. This blog intends to attenuate the pressure on you and help you make a good decision. We will walk you through the details of the several variations and types of wooden art trending in the market. This article focuses mostly on the classic and modern wooden sculpture. 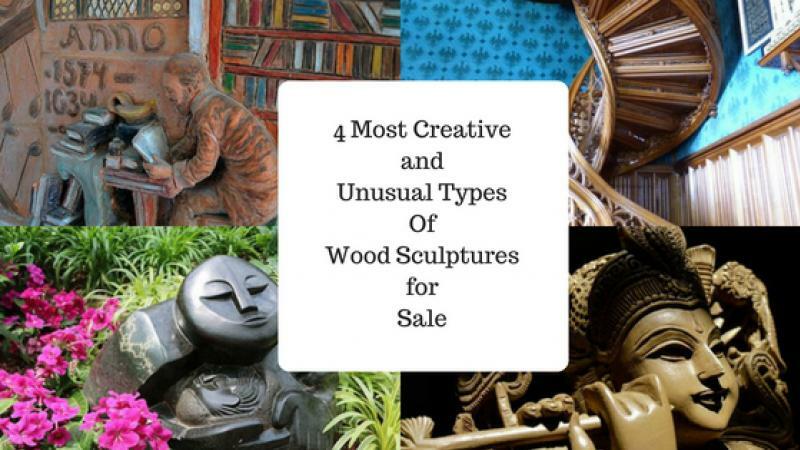 Read on to find more useful information about some of the most creative and unusual types of wood sculptures for sale online. Classic wooden sculptures tread mostly along the traditional lines of sculpting, sticking to conventional concepts and themes of work. These sculptures mostly deal with the art of orthodox storytelling through statues and sculptures. Traditional wooden sculptures can be found exhibiting mythological tales and characters from the ancient times. Most of these traditional artworks are inspired by the era related to the advent of Buddhism. The wood used to carve these sculptures mostly comes from the traditional options like the Sangwan wood or the mahogany wood. The texture, quality, and size of the sculptures vary depending on the timber used. The classic wooden sculptures go well with formal settings and add elegance to plain, mundane rooms and spaces. You can even buy life-sized wooden art if space is not a problem for you. If classic is your taste of things and you are going for an orthodox décor for your home or office space, you can explore these classic wooden sculptures online on almost every e-store dealing in wooden artwork from classic artists. As the name is suggestive, this is one of the types of Wood Sculptures devoted to the idea of exploring and experimenting with newer, modern themes and concepts, going totally off-beat in their approach and outlook. New-age artists are getting more emboldened in their way of treating their subjects. The modern wood art does not fit in a well-defined boundary and transgresses genres like abstract and geometrical. There is no specified definition or limitation on what a modern wooden art sculpture might deal with. The concept can be a totally strange one and the artist could still completely pull it off with their imagination and wits. The timber quality used in these modern sculptures varies according to the shape, size, and the concept of the work. These artworks look good with modern, unconventional settings and can also be used to enhance the looks of open spaces like balconies and gardens. Even if you are going for an unorthodox decoration for your workspace, these abstract arts just fit in. Especially the geometrical modern wooden art sculptures look good at office and professional places. Talking about home décor, you can keep these modern wooden sculptures in any ordinary room painted in plain, pastel shades and just watch the chic transformation happen. You can explore a dazzling range of modern wooden sculptures online at any of the art e-stores. Wooden sculptures carved to adorn your blissful space of greenery are usually made of harder wood than usual. They are meant to endure the effects of heat and Sun over years. These types of wood sculptures merge very well with the settings of a garden and enhance the natural look of it. The wooden sculptures specially made to decorate your gardens include wooden birdhouses, wooden statues, and fence and hedge embellishments. These sculptures are coated with a protective layer to protect them from the side-effects of a constant exposure to light, heat, and dirt. These pieces run a high risk of damage through contact with water that might be used to keep the plants hydrated. That is why the garden sculptures require a tad bit more maintenance than your routine woodwork. But they are completely worth it for the elegance that they bring to the looks of your garden. Are you are a gardening enthusiast and like to keep enhancing and decorating your yard? you might want to check out the collection of awesome garden wood sculptures online. Indoor wooden sculptures are meant to stay inside the comfort of your house. Thus, they come in very delicate textures and designs to give your living space a sleek, posh look. These sculptures are available in all shapes, sizes, and designs depending upon your tastes, interests, and the space available. You can put them in your cupboard, on your table, or in a corner of your room. This will definitely make the whole space come lively. You can explore the vast range of indoor wood sculptures online and choose the perfect one for you. We hope the article was helpful. It’s time to explore now. You can explore different types of wood sculptures and buy wood sculptures online at Showflipper. Happy Buying!